When you invest in real estate, you want the house to be in working shape, make a good showing, and sell for a comparable price for the market. Forbes says property owners who invest in staging sell houses at a faster rate. Nearly 95 percent of homes with staging sell in less than two weeks. These houses often go for over 15 percent of the comparisons for non-staged homes. When you are putting up homes for sale in the cold, winter months, then you may come across a scant few visitors on open house day. How can you entice people to come out of nice and cozy houses to see your place? Use a professional stager to design a stunning space that beckons for potential buyers to take a closer look. Besides selling faster and for more money, what other benefits are there for staging a home? With the right home staging company, your house can become a place that potential buyers envision the family living in for many years. Staging can create an environment that potentially sparks a bidding war. You may end up getting more money for your house because more than one person wants to purchase it. As an investor, nothing matters more than a reputation for trust, transparency, and quality homes. Your brand cannot go wrong when buyers see immaculate photos and quick turnaround times under your name. Forbes tells web viewers to use accents and pillows to add a little pizzazz but to stick with the basics when painting accent walls, keeping furniture, and choosing finish colors to refresh the home. Staging helps you choose how you want your house to talk to people who might want to buy the property. HGTV says personal belongings, photographs, and eclectic furniture only appeal to groups with the same preferences. To appeal to the broadest audiences, using neutral tones and classic themes like navy and white or adding crown molding can boost the value of your house and help it sell faster in the winter. Shoveling the sidewalk is not enough to entice people driving by to stop and look at your house when they see an open house sign. When you take the time to clear the driveway, porch, and steps and add a fresh layer of salt, buyers will see a safe, crisp, and clean landscape. Potential homebuyers appreciate the manicured look and feel the outside represents how well you maintain the inside. U.S. News says to clear off decks and patios as well for the best results. Nothing looks more uninviting than a boring white door and a drab entrance. Buyers like to see a little greenery and life when seeing the curb appeal. A few potted evergreens, some bright planters, a red front door, shiny new address decals, and a well-lit entrance invite home shoppers to come in and take a look around. You can use programmable light timers to avoid tripping hazards at night. You want your buyers to be comfortable when walking into your house. One way to welcome these guests is to have a coat rack or hooks near the door. If you have a mudroom, then clearing out all of your family's coats, scarves, and boots will give buyers a place to put these items if you are asking people to remove shoes before the tour. Plus, it will help the viewers envision walking in at the end of the day. Boost the appeal of the home by opening up the blinds, throwing back the sashes, and tying back long drapes. Making your house bright will help buyers feel comfortable. Another tip from U.S. News is to warm up the house before the showing to keep buyers in the house longer. The warmer it is inside, the more likely people will be to take off coats, ask questions, and hang out looking at the house. Reading benches, spa seating, and breakfast bars are cozy areas that give people places to unwind and relax. Each home you stage can benefit from one or more of these areas. The family room, basement, kitchen, and master bedroom are the best places to create these nooks. You can add a coffee bar in the kitchen or a new vanity area in the bathroom for the most appeal. 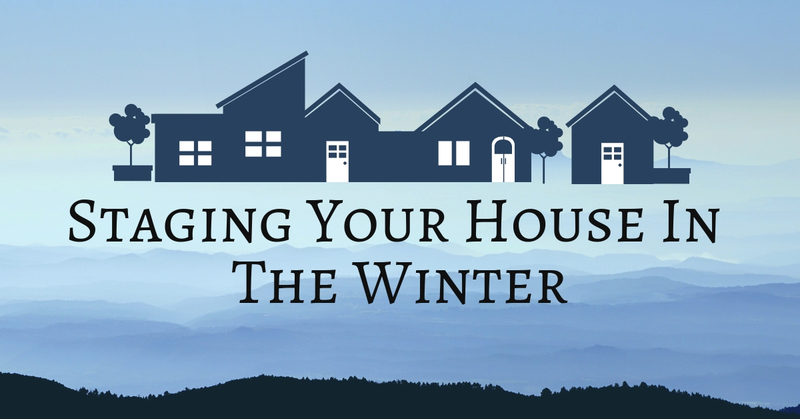 Selling your home in the winter relies on staging. When you try to sell a bare home, buyers are likely to consider other properties first. You are selling the home, not your lifestyle or choices, so detaching yourself and following some of these staging tips can help you get the most money out of your house no matter what time of year. For more information about how staging can help your home for sale, contact your local trusted Realtor.